Storytelling combines the intensity of a solo performance with the intimacy of a face-to-face conversation. "Storytelling at its best is mutual creation. Through the interaction between teller and listener, storytelling speaks to the inner child to nurture the human spirit." - Ellin Greene, author of Storytelling: Art & Technique. The storytellers say it's the oldest art form, even as they acknowledge it's one of the most obscure. 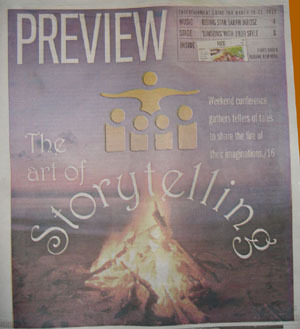 But this weekend, storytelling will claim the focus as the League for Advancement of New England Storytelling holds its annual conference, called Sharing the Fire, in Albany. This will be the first time the 30-year-old event will take place in New York. About 200 storytellers will occupy the Ramada Plaza for workshops and performances. They're all open to the public, including a recent innovation that is bringing new vitality to storytelling — the story slam, in which people have five minutes to tell a story while competing for prizes. "Before they were drawing those pictures on the caves in France, they were telling stories around the campfire," says Kate Dudding, a storyteller who lives in Clifton Park and helped organize the conference. "So first there was storytelling, and out of that came theater. Storytelling is sort of the bares-bones version of theater." It's one person and an audience. But unlike traditional theater, where the actors deliver their lines pretty much the same way every time, storytelling involves interaction with the audience and improvisation. "Professional storytellers, for example, will come to a space with a bag of stories," says Yvonne Zinicola, executive director of the New England organization (it also includes New York). "They'll take them out, but by the time they put them back into the bag they won't be the same stories. "That's why we promote the live art of storytelling. We believe something very valuable and unique happens because of the interaction and energy that takes place face to face." Sharing the Fire offers lots of face-to-face storytelling, starting at 7 p.m. Friday at Page Hall on the University at Albany's downtown campus with stories about New York from New York storytellers. It's the only event not happening at the Ramada Plaza. At 8 p.m. Saturday, five of the best storytellers from the League for Advancement of New England Storytelling perform. And at 9:30 p.m. Saturday, the story slam takes place; some storytellers have been pre-selected, and others will be chosen by lottery from the audience. 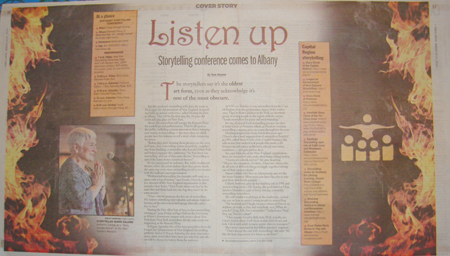 At 9:30 a.m. Sunday, young storytellers from the Capital Region close the performance aspect of the conference. They're from Children at the Well, an interfaith group of young people in the region with the motto: "Youth storytellers for peace and understanding." It's one of several local storytelling groups. Another is Story Circle at Proctors, which, as Proctors' resident storytelling company, puts on events throughout the year. Dudding helped start Story Circle at Proctors five years ago. (There's also a local organization of storytellers, founded in 1983, called Story Circle of the Capital District.) She tells stories (her niche is real people who made a difference) in such places as libraries, schools and senior residences — and gets paid to do it. Yes, says Zinicola, of the New England organization, there are storytellers who make their living telling stories. "I know, it's a shock, isn't it?" she says, laughing. "They're the exception, of course. There are others who do all sorts of different things to toggle together a living out of their various talents." Marni Gillard, who lives in Schenectady, says it's like the music business. Most musicians have day jobs to support their after-hours passion. Gillard, however, gave up her teaching job in 1991 and started telling stories. On Sunday, she performed at Glen Sanders Mansion as part of Story Sunday, a monthly storytelling series there. She will conduct workshops at the conference, including one on how to attract young people to storytelling. "They assume I read to little kids. Well, actually, no, I don't read to them. I tell them stories. And it's not just kids. I do it with adult women, senior citizens, teenagers." She's never surprised by her fellow travelers' response. "That's always the case with storytelling," she says. "It's like the best-kept secret of a fabulous art form."